12-Year-Old Kid Did What? Twice? 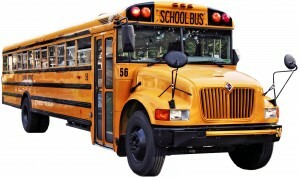 Police say that a 12-year-old charged in June with stealing a school bus and taking it on a joyride has done it again. According to the Parker Police Department and Bay District Schools, 12-year-old Michael Propst is charged with taking a bus from a compound at Parker Elementary School and driving it to Franklin County Tuesday evening. In June, Propst was charged with taking a bus and driving it from the same location to the Wal-Mart on Front Beach Road, a distance of 15 miles. 15 miles! Yikes. What about this time? This time, the youth drove the bus to Franklin County, a distance of more than 55 miles.